--- Charley Patton "Tom Rushen Blues"
A man and a woman are seated in a restaurant in New York City. 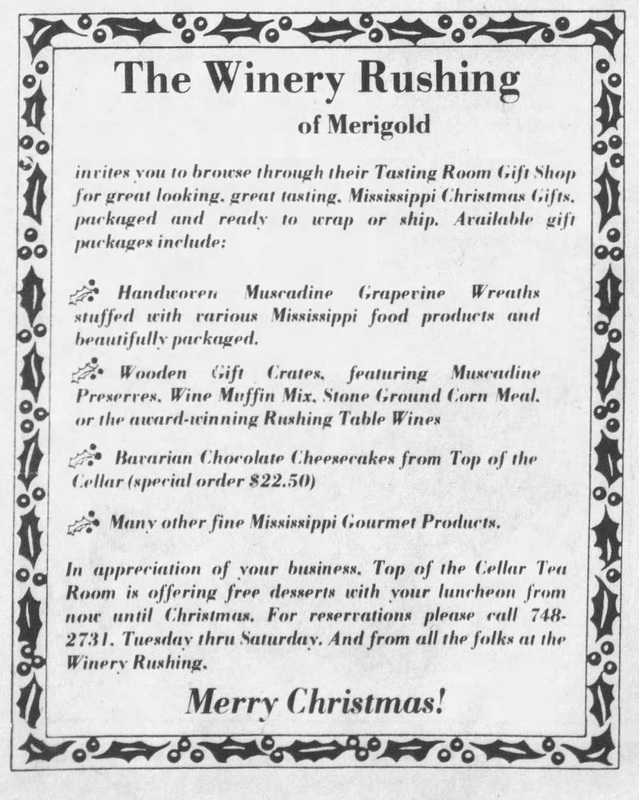 Rushing White Wine from Merigold, Mississippi? 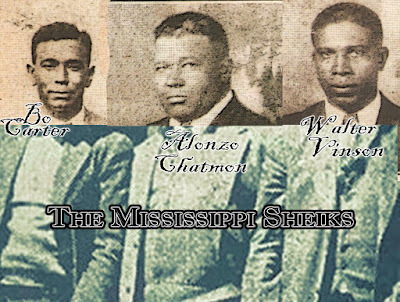 That’s the dream of the members of the Rushing family of Greenville, who have begun work on the first commercial winery in Mississippi since Prohibition. The Winery Rushing is located on 350 acres of Delta land overlooking the Sunflower River just southeast of Merigold. And as 24-year-old Sam Rushing walked last week through the rain-soaked mud toward the vineyard site, his voice became more excited and his actions more animated. This is more than just a job to Sam Rushing. 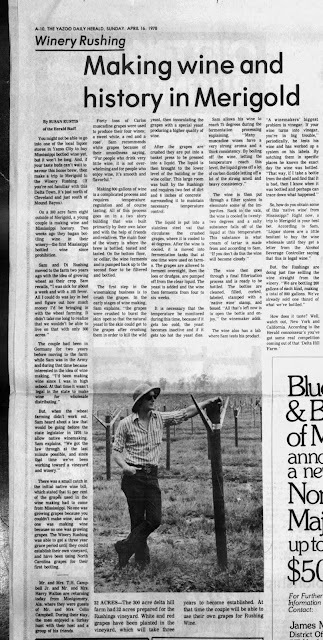 "We plan to locate the vineyard on 35 acres," he said while pointing to rows of wooden posts in a peachy field. The "we" Sam referred to are his wife, Diane: and his father, O.W. "Dutch" Rushing, who owns a communications business in Greenville. The winery is strictly a family affair, owned by Sam, Dutch and Diane. Sam and Diane live In a small but comfortable home on the winery and theirs will be a full-time job. Diane has been working at Delta State University in Cleveland, but she will leave that job to devote all her efforts to the wine operation. The vineyard will not produce the grapes needed for wine for about three years. Until then, the Rushing’s will import grapes from North Carolina. Construction has already begun for the underground storage-fermentation building and an adjoining office and bottling plant. They hope to be crushing grapes this fall. The first bottle of Rushing White Wine will probably go on sale next summer. Red wine has as longer fermentation period. The Rushings will be using Muscatine grapes, which are native to the Southeast. But instead of the cheaper "pop" wines usually associated with the Muscatine, the winery produce only a "quality table untie," according to Sam Rushing. "We will be using the finest, the highest quality Muscatine grape--we want to make a good table wine," he added. The winery has already received a license from the federal Bureau of Alcohol, Tobacco and Firearms in Atlanta after the Mississippi legislature passed the native wine law, per state wine operations without heavy taxation. The operation must also get approval from the state's Alcoholic Beverage Control Division of the State Tax Commission. But the paperwork is only one of the problems involved in starling a wine operation. Workers will also be needed in the vineyards, although Delta State students have been employed to make sense of the work. And the Rushing’s are concerned about getting a market for their $25,000 investment. "We will aim primarily for restaurants," Dutch Rushing said. "We hope to convince restaurants to use our wine as a 'house wine' and ship it to them in kegs." 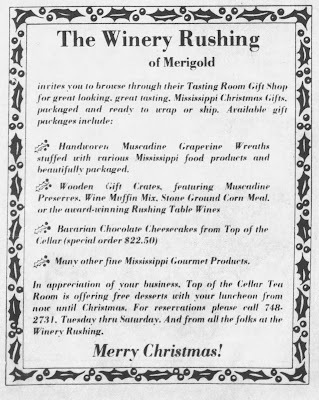 The Rushings will be able to distribute from the winery in Merigold without having to go through the state's liquor warehouse in Jackson. "We can arrange our own distribution, even sell it right here at the winery if we want to," said Sam Rushing. 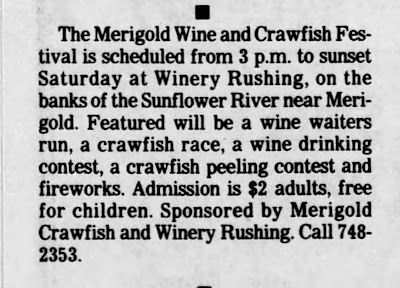 The Yazoo Herald, Apr 16, 1978. The Rushing family has always been interested in wine. Sam and Diane lived in the southern part of West Germany for a year and, as Diane says, "Wine growing was a way of life there." Dutch Rushing has traveled to France, to California and to New York, pursuing his interest in grapes. Fortunately, the family has had a lot of advice from wire experts in Mississippi—such as Dr. Doris Stojanavic, who heads the newly created Department of Enology science that deals with wine and wine making) at Mississippi State University at Starkville. MSU has established its own winery and is doing research in hopes that Mississippi will one day become a wine-making state. The Rushings have also consulted Dr. Alex Mathers of Mathersville, who serves as a consultant to the giant Gallo wine company in California. 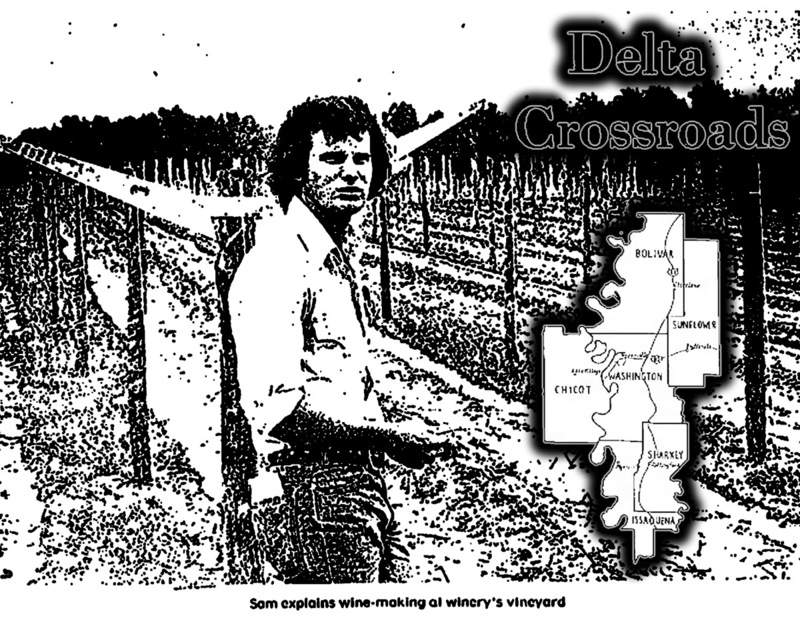 And, like other Deltans involved in agricultural operations, the Rushings have received help from the Delta Branch Experiment Station at Stoneville—which just happens to have a grape-producing vineyard. "There's a lot we don't know," says Diane, "but we intend to learn." Although tooth Sam and Diane grew up in Greenville—Diane is the daughter of Mr. and Mrs. Res Paul—both say they enjoy life in the country. They graduated from Mississippi State, she with a degree in English and he with a degree in agronomy—with a major in, what else, soils. Although it will be another year before the Rushings can sell their first bottle of wine, they have already picked out names for their products: Rushing Red, Rustling White and Rushing Rose. So, in about a year, when you're dining out, don't forget the wine. And make it Rushing White from Merigold, Mississippi. 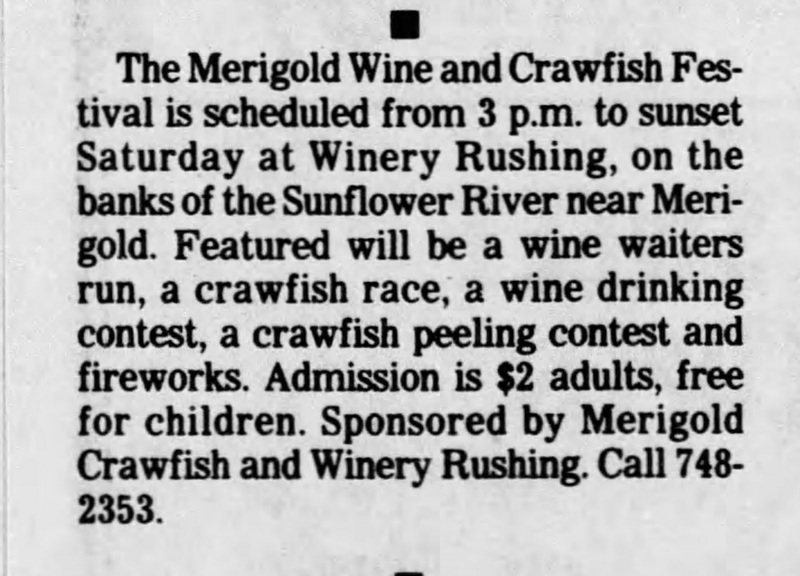 see, Clarion Ledger, June 7, 1984. 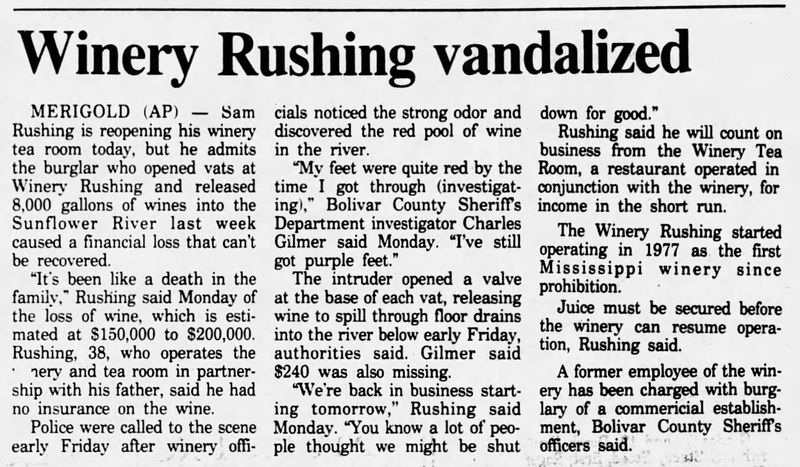 In the winter of 1990, however, a former employee vandalized the winery and ruined an estimated $200,000 worth of products. 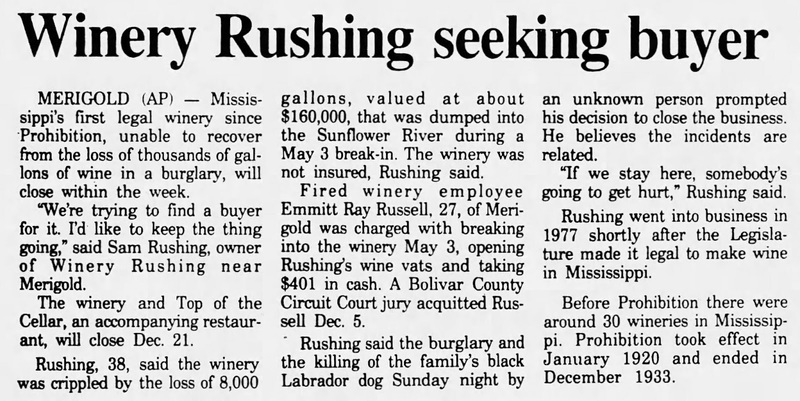 Sam Rushing had no insurance on the wine, which forced them to close down their operation.